Many of us do not realize that the real creator of spectacular artworks is the nature itself. Do not smile I will prove it. In fact, Suzanne Rippe – a French designer proves it with its line offunctional sculptures that could be called art furniture, with name Blocs. 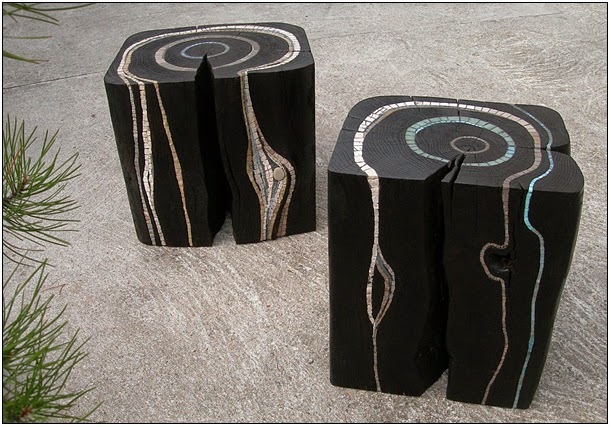 These functional sculptures are created of pieces from old beams or trunks that Suzanne Rippe inlays withmosaics, as she follows the natural structure of the wooden grain. These art products, created by “ordinary” as many of us believe, trunks (wooden stumps) are beautiful and very functional. Depending on their size they could be used for art furniture like stool or coffee table in your interior or outside on the porch or yard.